Locating a gluten free sandwich anywhere outside of the confines of your kitchen is next to impossible. At Pica Pica on Valencia Street, you can stop in for a “Maizewich” just like the good old days. Everything on their menu is gluten free. 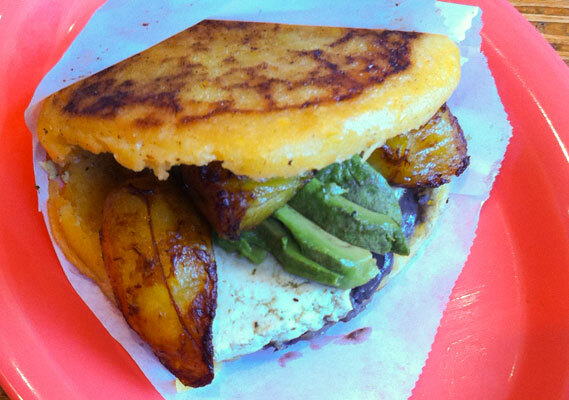 If you’ve never tried an Arepa, Maizewich or Cachapa, they are variations on a delicious Venezuelan corn bread which looks something like a cross between a pancake and pita bread. Choose your specific corn pocket and have it stuffed with a variety of fillings, like tofu, plantains, black beans and a zesty spread or juicy pulled pork with shredded cheese- they even have a chicken salad filling. Two specific vegan options are available, and for the dairy sensitive carnivores- just ask them to leave off the cheese. The Pernil (shredded seasoned beef with plantains and black beans) with or without cheese is delicious- among many others. Don’t ignore the tasty sides offered like yucca fries and sweet plantains. Gluten free beer on tap. I just necessary some information as well as had been looking upon search engines for this. We frequented every web site that arrived on first site and did not obtained any kind of related outcome then I thought to take a look at the second 1 and also got your site. this really is things i wanted!